Located in the backyard of San Vitale, the Mausoleum of Galla Placidia inRavenna is known for its ancient and breathtaking mosaics. The small brick structure dates from around 430 AD, making it one of the oldest monuments in Ravenna. Galla Placidia, a powerful Roman empress, was never buried here but likely commissioned the building. Click here to read more about the Maasoleo di Galla Placidia. Click on the photo for a panoramic view of the inside. The Basilica di San Vitale in Ravenna dates from the mid-6th century and contains what are probably the finest Byzantine mosaics in the western world. Click here to read more about Basilica San Vitale. Click here to see a panoramic view of the Basilica San Vitale Abside. 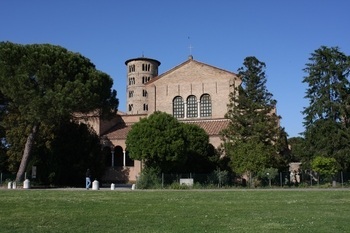 The 6th-century basilica of Sant'Apollinare in Classe is located in Classe, the small harbor town of Ravenna located about 4 miles south of the city center. Like most Ravenna churches, it is known for its exceptional Byzantine mosaics. It also has elegant architecture and a fine collection of early Christian sarcophagi. Click here to read more about the Basilica of Sant'Apollinare in Classe. 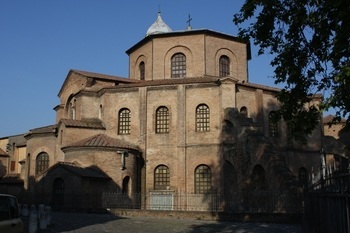 The Basilica di Sant'Apollinare Nuovo is a 6th-century church in easternRavenna. Named for Ravenna's first bishop, it is famed for its two side walls full of figurative mosaics dating from c.500 (under the Arian king Theodoric) and c.560 (under Catholic administration). Click here to read more about Basilica di Sant'Apollinare Nuovo. 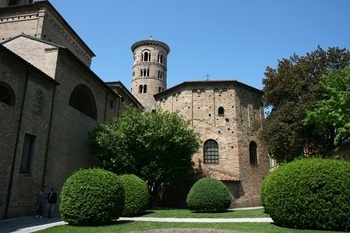 The Arian Baptistery (Battistero degli Ariani) stands in a small square next to the old Arian cathedral of Santo Spirito in Ravenna, Italy. It was built by the Ostrogothic ruler Theodoric at the end of the 5th century. Click here to read more about the Arian Baptistery. The Neonian Bapistery (Battistero Neoniano, also known as the Battistero Ortodosso or Orthodox Baptistery) is an octagonal baptistery built in the 5th century. It is the oldest monument in Ravenna and contains some of the city's most beautiful Byzantine mosaics. Click here to read more about the Neoniano Baptistry.